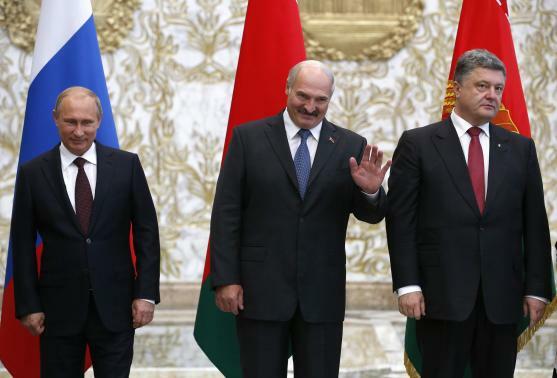 Russia has called for immediate Ukraine ceasefire talks in the Belarusian capital Minsk. Ukrainian troops “must leave positions from which they can harm the civilian population”, Russia’s Foreign Minister Sergei Lavrov said. Ukrainian and Russian officials are due to hold talks with separatist rebels and international monitors in Minsk on September 1. Some 2,600 people have died in eastern Ukraine since fighting began in April. The conflict broke out after Russia’s annexation of Ukraine’s southern Crimea peninsula in March. Last week’s first direct talks between Russian President Vladimir Putin and his Ukrainian counterpart, Petro Poroshenko, did not lead to any major breakthrough. The separatists have been gaining ground on Ukrainian forces in recent days, in both the Luhansk and Donetsk regions, and further south around the port of Mariupol. Ukrainian military spokesman Leonid Matyukhin said troops were battling a Russian tank division in the city of Luhansk. Overnight reports said separatists had taken control of the airport there. On Monday, September 1, Sergei Lavrov said he was counting on the Minsk talks to focus on “agreeing an immediate and unconditional ceasefire. He added that there would be “no military intervention” from Russia in Ukraine. “We are for an exclusively peaceful resolution of that most serious crisis, that tragedy,” Sergei Lavrov told students in Moscow. The meeting of the so-called Contact Group in Minsk will include representatives from the Organization for Security and Co-operation in Europe (OSCE). On the eve of the talks, President Vladimir Putin said the issues of “statehood” for eastern Ukraine needed to be discussed to ensure the interests of local people were “definitely upheld”. “Russia cannot stand aside when people are being shot at almost at point blank,” he said, describing the rebels’ actions as “the natural reaction of people who are defending their rights”. Vladimir Putin’s comments came after the EU gave Russia a one-week ultimatum to reverse course in Ukraine or face more sanctions. He dismissed the EU threat, accusing it of “backing a coup d’etat” in Ukraine.